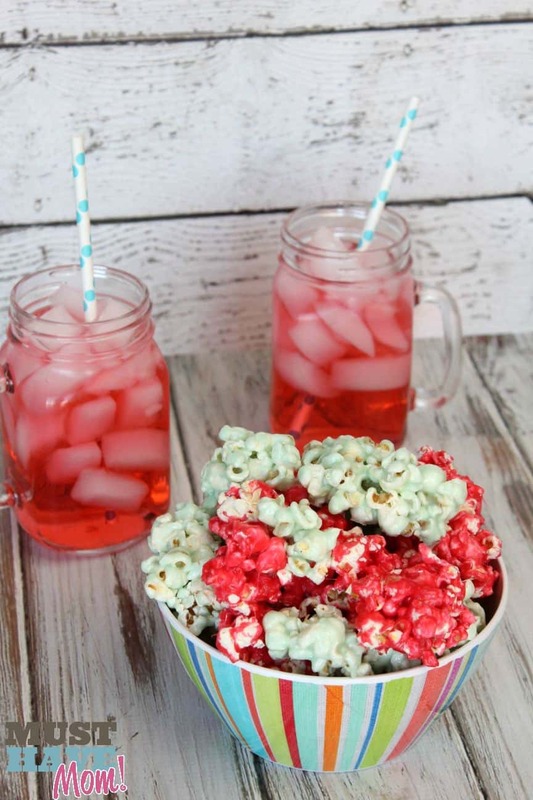 Kool-Aid Flavored Popcorn Recipe + Watermelon Drink! Several years ago there was a store in the Mall of America that sold flavored popcorn. It was my favorite and it has been gone from there for quite some time. I was looking to replicate that flavored popcorn that I loved and I finally found the perfect recipe. 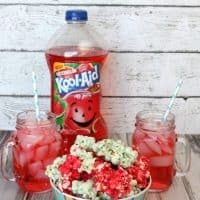 I made this yummy Kool-Aid flavored popcorn this weekend and served it with a Watermelon drink and it was gone in no time! The popcorn has a crunchy glaze on it that is flavored and absolutely delicious. To make it you will need to pop 1/3 cup of popcorn kernels and measure out 12 cups of popped popcorn into a large mixing bowl or pan. I found that mixing the glaze with the popcorn in a mixing bowl worked much better than trying to mix it right in the pan. Bring sugar, corn syrup and butter to a boil for 3 minutes in a medium saucepan. Remove from heat and add Kool-Aid unsweetened drink mix and baking soda. Mix well. Pour glaze over popcorn in mixing bowl and mix well. Spread into ungreased non-stick pan. You may also use a cookie sheet lined with a silpat mat. 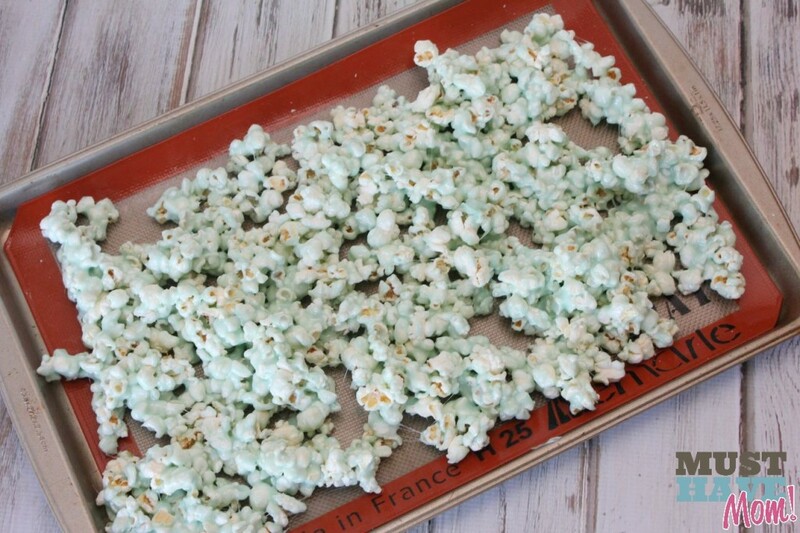 I found that this worked better for achieving a crisp glaze on the popcorn. Bake for 50 minutes, stirring every 15 minutes. Cool directly on Silpat mat or on wax paper. Break apart and enjoy! Serve with a Kool-Aid watermelon drink for a refreshing snack! I found the watermelon Kool-Aid in a handy premade jug in the juice aisle at Walmart. This is the perfect size to bring to the cabin this Summer to cool our thirst! Since it’s pre-made I don’t have to worry about bringing along sugar and bottled water to mix it up. It’s all ready to drink. 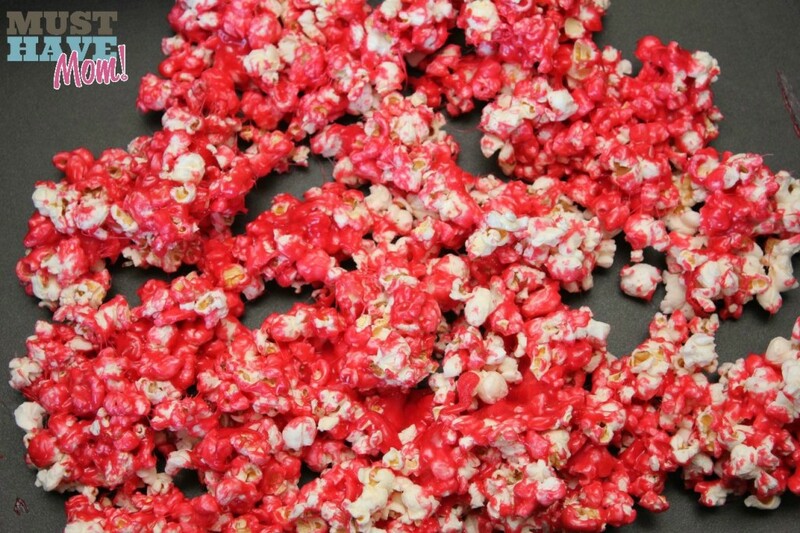 Flavored popcorn recipe using Kool-Aid unsweetened drink mix. Measure 12 cups popped popcorn into large mixing bowl. Mix together sugar, corn syrup and butter in medium saucepan and bring to boil over medium high heat. Cook 3 minutes stirring frequently. Remove from heat and add Kool-Aid drink mix and baking soda. Mix well and pour over popcorn stirring to coat the popcorn. 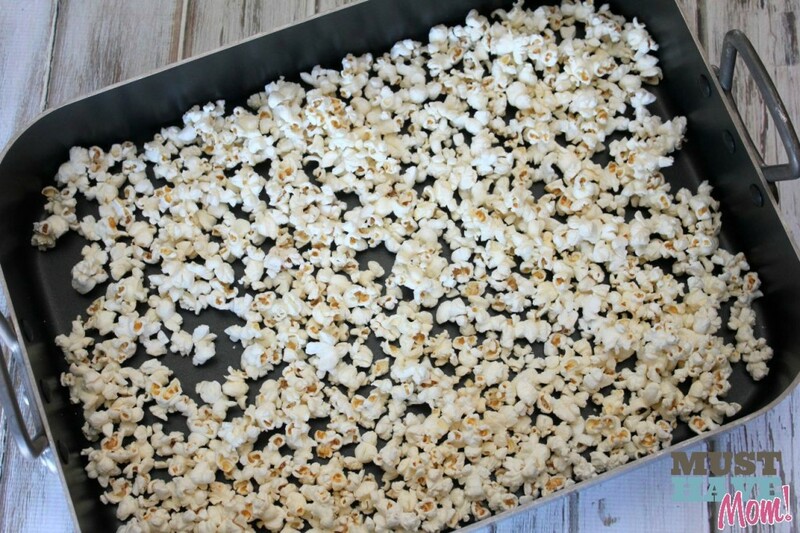 Spread popcorn in large baking dish (ungreased non-stick pan) or cookie sheet lined with Silpat mat or parchment paper. Bake 50 minutes, stirring every 15 minutes. Spread onto wax paper to cool or leave on silpat mat and cool completely. Break into pieces and store in zip top bag. 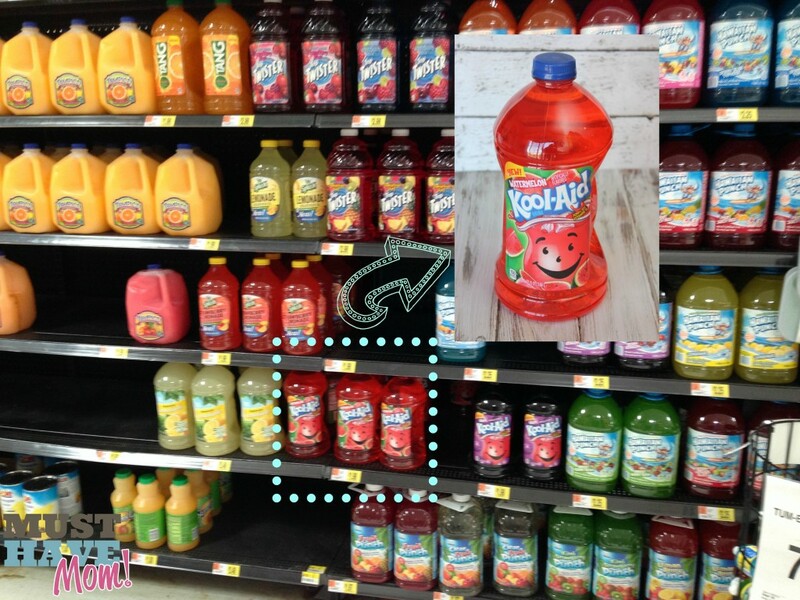 Find the new ready to drink Kool-Aid flavors at Walmart! Like this recipe? Pin it, Share it, Tweet it! 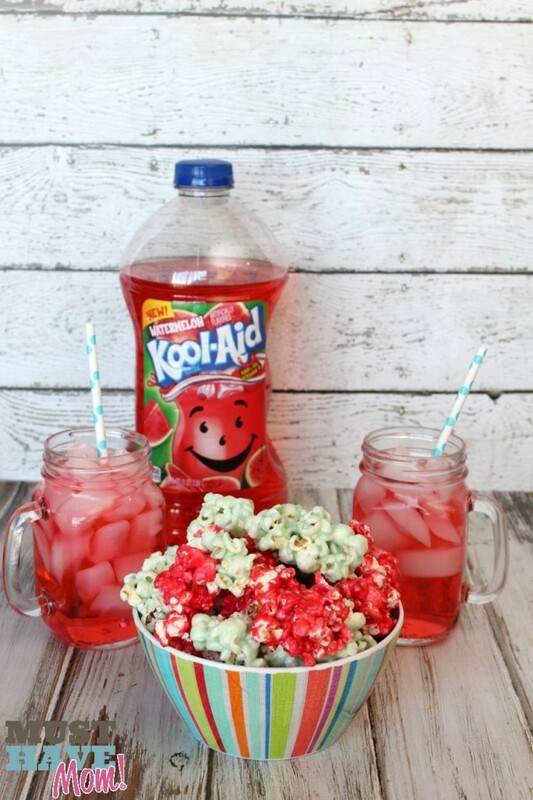 What Kool-Aid flavor would you make your popcorn with? *This #KoolOff post is part of a social shopper amplification through #CollectiveBias. The text, images and opinions are all my own. « Go Natural For Baby With Seventh Generation Baby! Now this is something the kids surely would love, never heard of making it like this before, Thanks for sharing! Never thought about doing this before! I bet it’s delicious!! Love the recipe , Thank you ! The kids will love this ! Wow sounds Yummy !! I’ll give this recipe a try !! My kids are going to love this! Plus popcorn is our go to snack. Thanks for the recipe! Popcorn is our favorite snack too! Love it looks so good !! Yes! It’s still only 20 cents a packet! Who knew Kool-Aid was so versatile? This is too cool! My kids would love it. This is really clever, I never would have thought about doing this to popcorn! 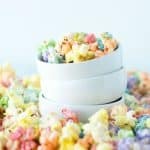 I’ve had flavored popcorn like you’re talking about from a store as a kid and loved it. I believe I’d love to give this a try. Thanks for sharing this idea with us. This looks like a fun party snack. Very colorful! 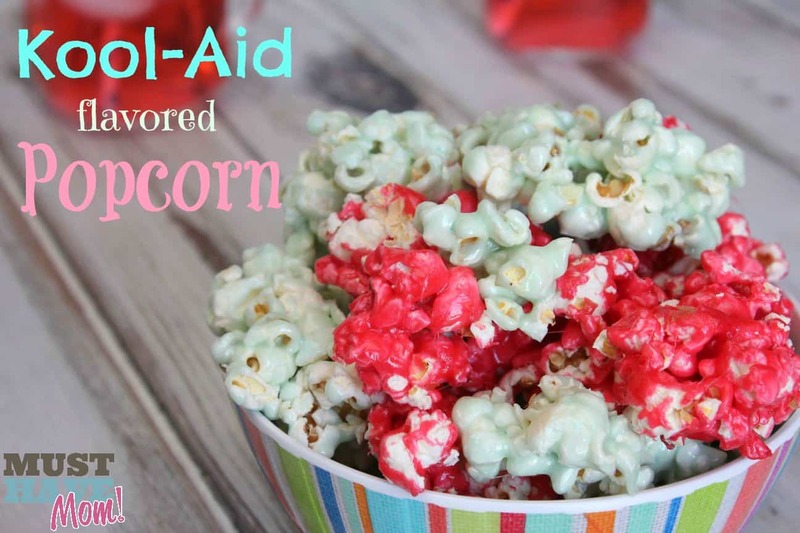 I would never have thought to use kool aid in popcorn. Love the colors too. 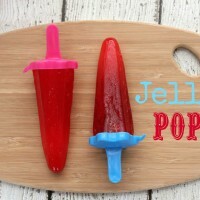 This is a fun summer treat! How fun is this?! Pinning! Oh cool! That brings back memories of the popcorn shops in the mall when I was a kid! This sounds great!! Thanks for the great idea and recipe. You have really got me thinking about making this soon. It looks great too!! I found reading your very novel recipe to be intriguing how did you come up with that??? Anyway, I think I HAVE to try it! Thanks. The kids would love this treat. It looks so colorful and yummy! This sounds like so much fun and with so mant kool aid varieties the possibilities are endless. This would make a nice movie night treat! 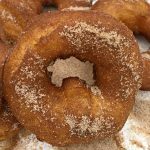 What a interesting and fun recipe! The kids will go crazy for this. Great for parties! Easy to make too! Yes, it’s perfect for parties! Just change the color/flavor to match the party theme. Colored popcorn? What a great idea to liven things up. I love it and will try this soon. My brother comes over every Saturday night and we make popcorn and watch movies. He’d be so entertained by this idea. It will be so fun! Thank You! !